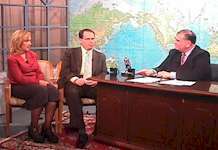 Watch Conservative Roundtable on "The Dangers of the "North American Union" | Watch More Shows! Are you tired of the liberal media? How they always distort the conservative message to make us look like the bad guys; how they ignore the destruction their socialist policies cause to our country; and how they seem to give news coverage only to the criminals, victims, and losers in society? Now YOU can do something about it by helping educate people in your community by helping get our free conservative TV program broadcast on your cable TV system. * Check our nationwide TV schedule to see if Conservative Roundtable is broadcast on cable in your community. If so, watch every week to get the conservative news and information you want; and spread the word by telling your family, friends, co-workers and church members to watch as well. * If your area is not on the schedule, we would appreciate your volunteer help by making a few phone calls and filling out a couple forms to get it on the air! It's a pretty easy project and there is no cost to you. Conservative Roundtable, featuring Howard Phillips, is the weekly television program produced by the Conservative Caucus: "America's Constitutional Government Citizen Action Group". Each week you'll find in-depth and critical analysis of the important issues which affect your life and our country. Liberal threats to our freedoms are exposed and conservative values and solutions are highlighted. It's like Meet the Press but without the liberal guests or the liberal bias. Conservative Roundtable brings you hard-hitting information which even Rush Limbaugh won't let on the air! Read the transcript of one of our shows about alarming Clinton scandals. Guest and topic list. All you need to do is to get the initial approval from the "public access" channel on cable to air this important program on a regular weekly schedule. 1. Call your local cable TV company and speak to the "public access" channel. Use the phone number on your cable bill or program guide, or get the number from the phone book. You do not need to be a subscriber to cable to use this channel. Public access is quite different from PBS/Public Broadcasting System. 2. Tell them you wish to be a "Local Sponsor" for a 1/2 hour weekly public affairs-type program which is produced at a different public access station. This usually doesn't cost anything. Ask them to mail you any forms and rules needed to for them to approve the program for broadcast. When you get the forms, call or e-mail Art Harman at 703-938-9626 and we'll help you fill out the forms, and then you can return the signed, completed forms to the station. 3. The station will contact you when they approve the show for broadcast or if they have any questions. We're happy to help you through this process. Let us know when they're ready for DVDs or video tapes to broadcast, and we'll send them to the station on a regular schedule. We pay the cost of the DVDs or tapes and the postage. There's no charge to you. That's all! Spread the word that Conservative Roundtable is on the air and enjoy the program! Conservative Roundtable is distributed through "public access" channels on cable television. Public access is "do-it-yourself" television, where you, a resident of the cable service area, may create or broadcast a television program on their channel, usually at no cost. You don't even need to be a cable subscriber. Most cable system have public access channels, but some don't -- call today and find out. Conservative shows have helped millions of Americans understand the real issues in America. Finally Americans are learning the facts unfiltered by the liberal media and it's making a big difference! These three simple steps are all it takes to bring this conservative TV show to your hometown. It's easy! To get started or for more information, contact Art Harman, the producer of Conservative Roundtable by email or at 703-938-9626. Thank you very much for your help. Interested in creating your own television show? Check here for a how-to guide. Washington D.C. area residents with TV/audio/photographic production experience, or an interest in learning: we are looking for volunteer crew members for our program. Let us know if you'd like to help. Copyright © 2010 The Conservative Caucus, Inc. All rights reserved.